Lyophilization or freeze-drying is a dehydration process that preserves food while maintaining their nutritional properties. Natural Brazil´s lyophilized fruits and vegetables are sold in powder form. We wanted the consumer to realize those two characteristics of the product at a glance. To accomplish this challenge we created refreshing and appealing images for the ziplock stand up pouches with adhesive labels where parts of the fruit or vegetable images are replaced by transparent windows that allow the powdered product to be seen through. The color of the powdered product completes the image in a surprising and interesting way. The photos of the fruits and vegetables against a wooden pattern convey an idea of nature and countryside, reminding consumers of nourishing and carefully produced food. 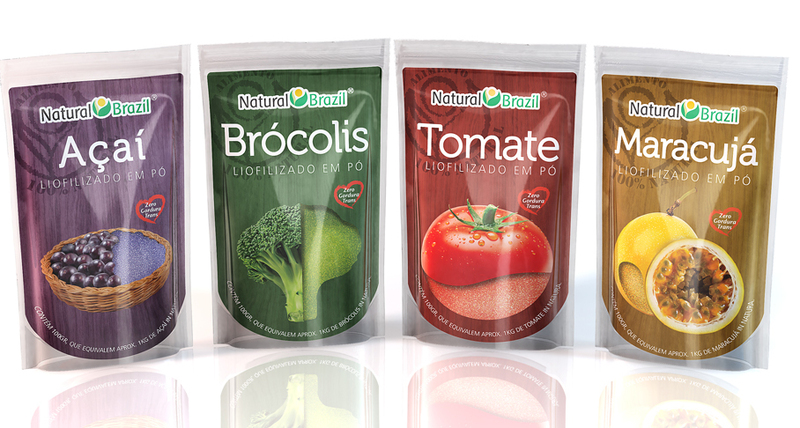 Lyophilized fruit and vegetable package design for NATURAL BRAZIL created high impact on points of sale through our effort to transmit a clear message to consumers. Check also stand up pouches and pots package design for NATURAL FIBRAS.